I’m head over heals for weekends like this where cozy evening thunderstorms are frequent, the sunshine pops out for much of the day, I’ve put in a good solid 5+ mile run with Stella along our local path by the river, Sean’s hysterically laughing to T.V. downstairs, and I made a delicious pie. There’s about a million more happy things I could add to what makes this weekend so heartedly happy…but that would just be an improper run-on sentence. Ooooohhh the storm’s picking up! We have nearly every window in the house open tonight (it’s the coziest way to save money on AC! ), and I’m listening to the thunder roll and the lightening crack. One one-thousand…two one-thousand…three one-thousand…HAH! It’s about 3 miles away. Anywho…can I tell you how scrumptious my new(lie) made Blueberry Pie recipe is?! It’s like…off the chain, as my sister loves to say about scrumptious food. She really does say that. My favorite story of when she recently said that was when she was in a health food store and asked for a specific kind of cheese. When the store manager asked her why it was so good, she goes “……because it’s off the CHAAAIIIN!” Love her. Can you tell that our humor is the same yet?! Okay sorry, BACK to my point, seriously. This recipe is SO good. I’m especially excited that I’m finally getting to the point where I can create new recipes on my own. I haven’t quite gotten down the ratios just yet. I still research multiple recipes until I finally have a good idea of how much sugar vs flour vs whatever else is needed. I’m getting way better though, and I been inspired to make my own Katherine-style recipes thanks to the site “Tasty Kitchen.” Have you seen this site yet? It’s a great website for cooking enthusiasts to share their recipes. Check out my page: http://tastykitchen.com/recipes/members/misskatherine/! If you decide to create your own profile in there, be sure to “friend” me. I have like…3 friends so far. I’m guessing that’s not cool enough yet. After you’ve pre-heated the oven for 400 degrees, start by pouring both the vanilla extract and the lemon juice over the frozen blueberries. In a separate bowl, stir together the dry ingredients – sugar, flour, salt, cinnamon, nutmeg, and brown sugar. Combine the blueberry mixture with 1 of the 2 teaspoons of butter, as well as the entire dry mixture – altogether in a pot on the stove. Stir this very gently on medium heat until the juices and dry ingredients are well mixed, but so there are plenty of un-broken blueberries still goin’ strong. Remove that mixture from the stove. While that cools, prepare the pie crust in the pan and spread the other teaspoon of butter along the base of the crust. Then, pour the blueberry mixture over the crust. 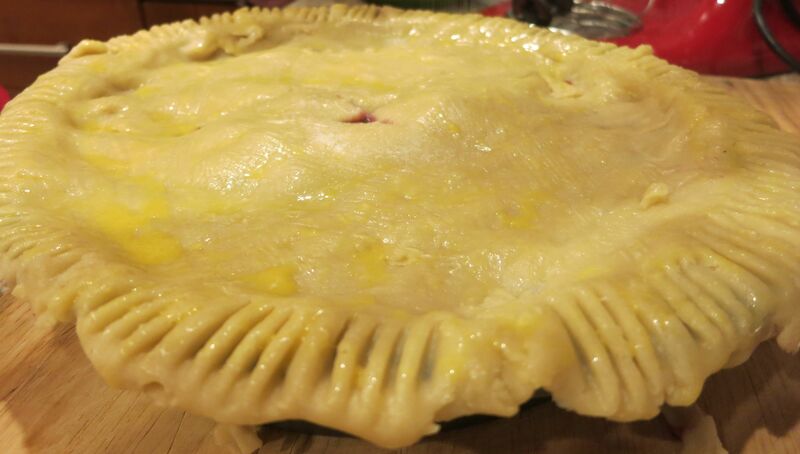 Carefully layer the 2nd pie crust over the entire pie…and trim away the excess dough. 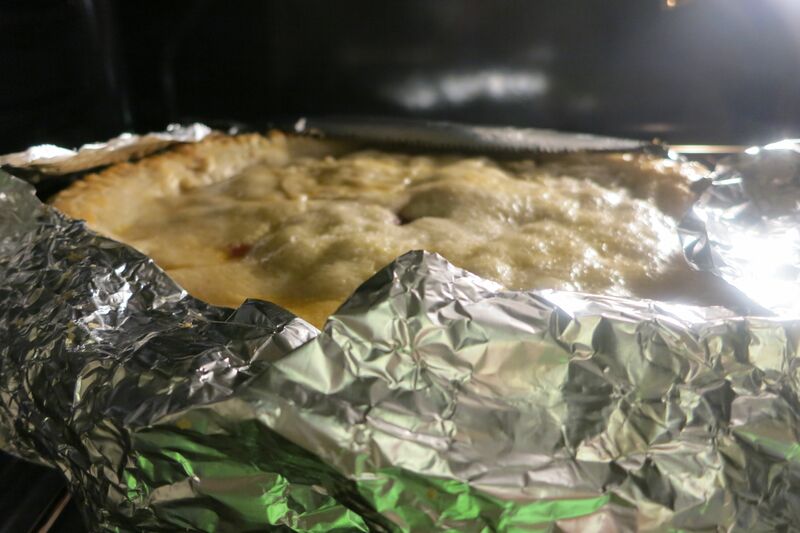 You’ll likely need that excess to carefully “plug up” some of the holes on the top of the pie. Then, score the middle of the crust to allow it to breathe. Add a fun little design to the edge as well! I just used a fork to create the design. Into the oven it goes! Again – 400 degrees for 35 minutes. About halfway through you’ll probably want to put aluminum foil around the edges so that they won’t burn. Tadaaaaaaaaa! Hope you enjoy. Sean and I did!